Coffee seems like a good starting point. This piece entitled “Cafe Emporio III” by Martin Stranka is extremely relevant to my current thoughts on coffee consumption. The mug appears to be flowing with the elixir of the gods and the handle is pointing to “on,” which would mimic how I feel when I have coffee in my mug. 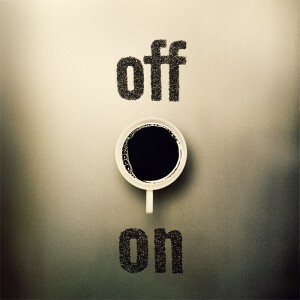 I also tend to agree that the “off” would be relegated to those times my mug is empty. In reality, I relate a little too much to this piece, but it’s simple, tasteful, and straightforward. What Martin has created here is the embodiment of my current work cycle. Moving on from coffee to the movie of the year in 2014; Guardians of the Galaxy. 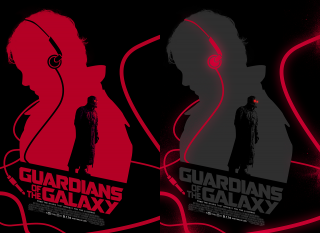 Well, it was certainly a stand out and this simple variation on the movie poster by Bosslogix is a great example of why less can sometimes be more. If you don’t believe that this minimalist poster embodies the spirit of the film, then you’re missing the picture or, in this case, the poster. The colors, the detail in some places, lack-of in others, and use of white-space plus slightly skewed text all complete the piece. It’s truly done by a master designer, and having seen some of Bosslogix’s other works, he is! Let’s stay in outer space shall we? Remember Melmac, the planet Alf was from? In fact, remember Alf? 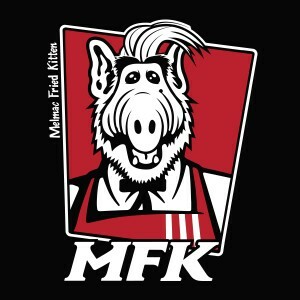 This piece, MFK or Melmac Fried Kitten, is everything that is right with a spoofed corporate logo. For those of us of a certain age, this spoof by Vitaliy Klimenko (donot182 on deviantart) is brilliant. Afterall, we enjoyed the show, though upon rewatching it, there’s only so much that holds up. But enough of that. This captures Alf as we remember him, the kitten eating alien from Melmac that crash landed into a family and into our hearts… Well, maybe that’s a bit extreme, but I still remember him fondly. When’s Alf getting his remake anyway? At least a movie would be nice to hear rumours about! One movie we don’t have to worry about waiting for is Star Wars. The fact that Disney is going to pump out films is both exciting and scary, two things that can be fun together. And this picture by Brian (Brianjm111 on deviantart) is also two things that can be fun together; libraries and Stormtroopers. I didn’t think this post would turn into a history lesson, but for those of you under a certain age, a library is a place where you can find a collection of physical books and other things containing the literary classics from a time well before Harry Potter. 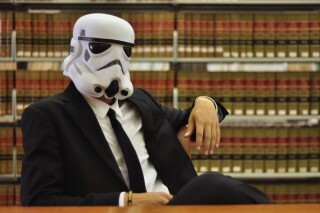 If I walked into a library and saw this guy just chilling, I would definitely get out of the library. I don’t want to be collateral damage when he can’t hit the hero he’s attempting to blast! 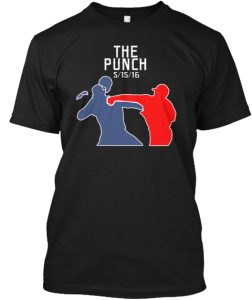 Just like the “Bat Flip” was immortalized for Blue Jays fans on a tee shirt, Rangers fans now have “The Punch” created by Paul Ylda. There is a nice touch to this shirt, not displayed in the picture… On the back it says #neverforget, which is just crazy. Anyone who saw that isn’t likely to forget it. Punches like that miss more often than hit in baseball melees. No damned wonder our legal system is in such a crappy state of affairs. That is in fact scotch on the rocks and while I’m not sure how you got to “our legal system” I don’t disagree with you and I do hope that you enjoyed the post. It was the picture of the law library…. a visual association.